Hey Friends, what's new? 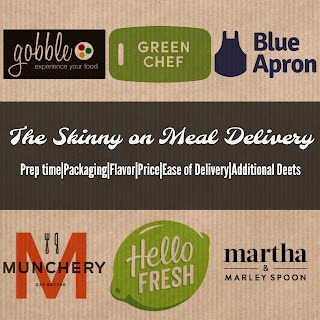 For the past several months we have been trying out a bunch of the meal delivery services available.....there are a lot to choose from! I thought it would be fun to share our experiences with each one that we've tried - all the deets are below. But, before we move on let's chat more. These services are super handy, but in all honesty, if you asked me if I use them all the time, the answer is a big fat nope! At first, I thought this could be a brilliant way to save money on groceries and not have to think about dinner.....and although that is still true, it can also sometimes feel like a chore to prepare and get these made before they spoil (except for Munchery). 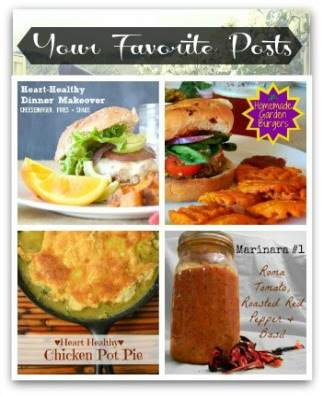 If you are someone who likes to cook, these meals can be fun and a good way to expand your skills and recipe repertoire. That said, home cooks (like me) may find it's easier to cook from what you've got in the fridge. If you are not a cook, these are a great way to learn, but may be cumbersome for a weeknight (especially if you've got a crazy toddler). So, after all this, what I've found works best for us is to use the service if we want some change in our regular menu, but not all the time. 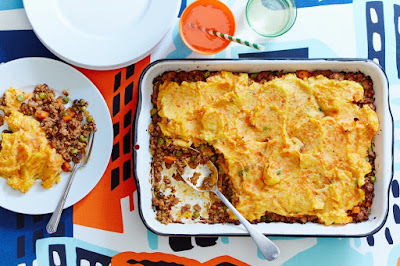 I also think the meal delivery services are great for when you are returning from vacation - having the food show up when you get home lessens the need to run to the grocery and the thoughts involved in planning meals for the week. Keep reading to see what we thought of each service (and look for the giveaway in the Blue Apron section)! Prep time - The Fastest. 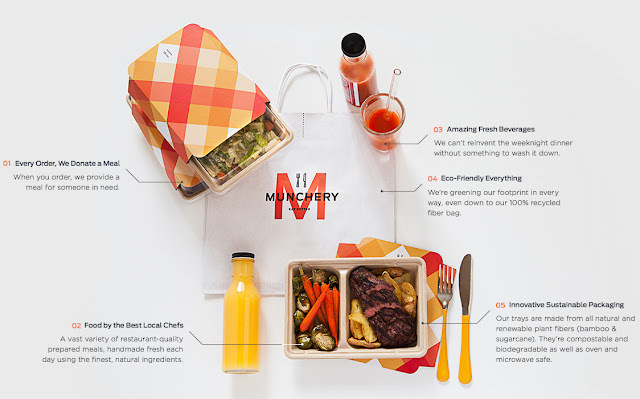 Everything from the Munchery is already cooked, so it only needs to be re-heated in the microwave, oven or toaster. "Eww" you may say, but no my friends, no. 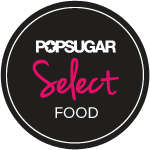 Read more about the taste in the flavor section below. Packaging - Munchery does a good job of using compostable containers with recyclable plastic tops. The meals are fully prepared, so usually just one container, unless there is a sauce or fresh (no heat needed) side. Flavor - OK, so YUM. Munchery food is really good. And I should preface this by saying, the thought of microwaving my dinner totally grosses me out. But this stuff does not taste microwaved. At. All. 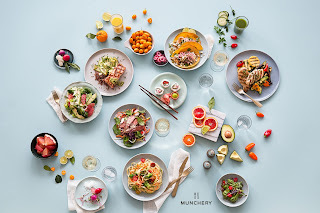 Apparently a lot of science went into how Munchery prepares the food so it actually tastes good coming out of the microwave....and it really, really tastes good. Price - The meals are about $9-$12 each, so similar to the un-prepared or semi-prepared box version competitors. Ease of delivery - Really easy. You can order Munchery food same day up to a certain time. Leave a cooler on your porch and they will drop it, plus text you when it's on its way and when it has been delivered. Additional deets - Munchery is nice because you can order one meal or ten and if you pick one option it doesn't limit you from choosing any of the other options (some of the boxed competitors do limit you, but have recently been changing this). The last minute ordering is great too and they have kids meals! Our toddler was a fan. I believe Munchery's delivery areas are more limited because this is more of a delivery service as opposed to a box being shipped by UPS or FedEx. That said, we live in a suburb of a moderately sized city and we can still get it delivered. 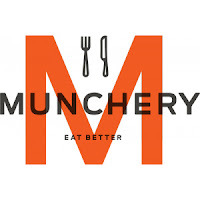 Here is a link to some of the things we ordered from the Munchery and reviewed. 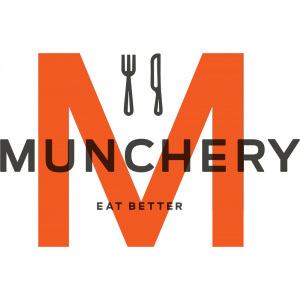 *Disclaimer - if you use my Munchery code, I get $20 too, so thanks! Prep Time - Like you are making your own dinner. So, a little time is saved because you have everything you need, it's labeled and you can unpack it into your fridge in "meal groups". Plus extra bonus points for time saved not grocery shopping. But, you still have to cut/slice/peel/chop/zest and occasionally mix sauces. Let's be real. This stuff takes time! What I typically do is order my box so it arrives on a Monday. That evening, after the toddler goes to bed, I do all of the prepping I can realistically do at once, then stick it all back in the fridge. For the next three nights all I have to do is assemble and cook each meal; with prep time now eliminated, it is pretty quick. Packaging - Blue Apron's box and all the internal packaging are recyclable, they also have a handy recycling guide on their website. If your town does not offer a recycling program, Blue Apron has a return program too - you can return 100% of the meal packaging and they will recycle it for you. They also note: We've partnered with the USPS to use existing delivery routes, so there's no additional carbon footprint to your return. Great work Blue Apron! 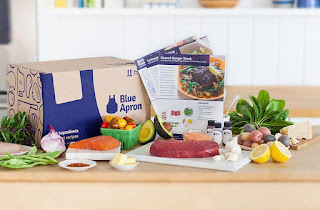 Flavor - We found Blue Apron to have the tastiest and most interesting dishes. There are always things that surprise me with their meals and we have not been disappointed or even "meh" once. The food is good and so is the quality. *Disclaimer - if you click the Ebates link and sign up, I get $25, so thanks! If you are not familiar with Ebates, it is a super easy and awesome service where you get an actual check every month for certain on-line shopping purchases. Ease of delivery - Pretty easy once you get it going. Your first order might be a week or two out, but after that you will receive meals weekly unless you skip or cancel. Additional deets - One thing I really like about Blue Apron is that I find I am learning a lot more about cooking than I already knew. I like to cook a lot and grew up in a cooking house, so learning new stuff is great. Some of my favorites that Blue Apron has taught me are how to make the perfect soft boiled egg (every. single. time!) and pickle onions. The meals also have a good variety, so I feel like we've tried a lot of new stuff as well. I also think their recipe cards are the most clearly written and easy to follow. Once you've used Blue Apron a bit they will send you free meals to share with your friends, it's always nice to send someone dinner! I have a few free meals to share for new customers, if you want one, shoot me an e-mail and I'll send one your way - first come first served basis for what I've currently got, no guarantees. :) That said, while it's nice to get food to give away, it would be cool if Blue Apron had a program where we could earn free meals for ourselves too. Prep time - The meals we got from Marley Spoon were simpler recipes than what we got from other services (like Blue Apron or Green Chef) and therefore, took less time to prep and make. I would place Marley Spoon somewhere between Blue Apron (prepping a big majority of ingredients) and Gobble (prepping almost none of the ingredients). 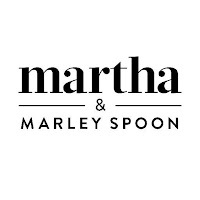 In one of my more brilliant mothering moments I had our 7 year old cook one of the Marley Spoon dinners for us (with oversight, of course) and he did great. Packaging - Overall I thought Marley Spoon did a better job of using less ice packs by keeping the non-refrigerator items (like veggies) on top, then wrapping the perishable items underneath in an extra insulated wrap with the ice. The non-perishable items were in bags with a sticker label indicating which recipe they were for. The perishable items were packed together in a plastic bag but there was no sticker. It was not terrible to figure out. I did feel like the use of extra plastic to group the perishable items was kind of excessive, but I did keep the zipoloc type bag to re-use it. Flavor - Well....it was OK. Overall the dishes filled our tummies but they weren't super tasty or surprisingly good like some that we have gotten from Blue Apron. Price - I got a free trial from a friend who uses Marley Spoon, so for me it was free. For a two person box, 3 meals per week it is $61.50, for a family box (2 adults, 2 kids), 3 meals per week, it is $106.80. Ease of delivery - This is a box service so it is shipped directly to your door in a refrigerated box. Like most of the services, there may be about a 1 week delay from when you place your first order, but after that you will receive the meals weekly (unless you skip or cancel). .....note the thick layer of mashers over basically the whole dish. I was provided with 1 regular sized potato and one small potato + 1.5 carrots to pull off this mash (in a 13x9 pan...maybe I was supposed to use an 8x8...idk because the recipe didn't indicate). Needless to say, there was not nearly enough mash to cover my meat. Let's just be real, the mash makes this dish. Who wants to eat a pile of ground beef with peas & carrots? If you are going to make this dish, I suggest doubling the amount of potatoes (I did). That said, the box should give you everything you need to make it look like the picture, so throw in an extra potato Martha. The other two dishes we got were Macaroni & Cheese with Crunchy Salad and Egg Noodles and Meatballs with Sour Cherry Jam and Salad. Prep Time - Like you are making your own dinner. So, you will be chopping, slicing, dicing, zesting, etc. They have color coded labels for each meal which was helpful. Packaging - Green Chef packaging is also recyclable and reusable. I'm still using a ton of the little jars I received in our package which are great for kiddo's lunches. You can learn more about recycling their packaging here. Flavor - Good, and the quality is outstanding. The piece of tuna that they sent us was near perfection. The overall flavor though was, in my opinion, not as interesting or tasty as some that we have received from Blue Apron. 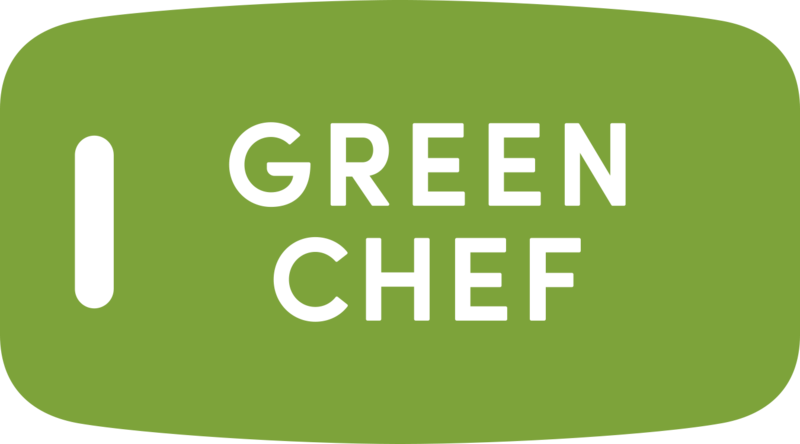 *Disclaimer - If you use my Green Chef code I'll get $25 when you place your second order, so thanks! Ease of delivery - Again, a box service so it is shipped directly to your door in a refrigerated box. Like most of the services, there may be about a 1 week delay from when you place your first order, but after that you will receive the meals weekly (unless you skip or cancel). Additional deets - I want to re-iterate the quality of this food. We were seriously amazed at the piece of fish we were sent. We are food snobs and picky about fish quality in particular, so we were impressed. I mentioned the color coding of the labels, which I thought was great too. 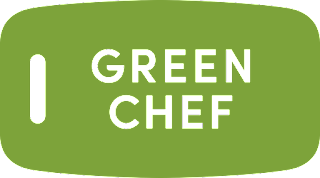 Green Chef is nice in that it also offers all different meal types, like paleo or gluten-free, which I think is a great service, especially if you are new to cooking with those methods. Also, the meals looked exactly like the picture when they were done and the portions were generous. Prep Time - Fast. The Gobble meals come pre-prepped: veggies chopped, cheese grated, even my pizza onions were caramelized. They call it a "10 minute dinner", I would say more like 20, but that's pretty good for prep time. 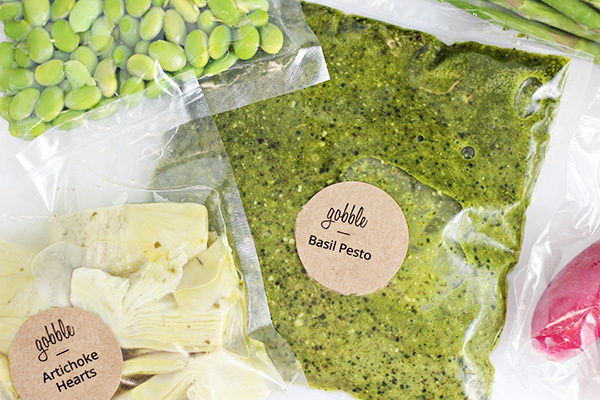 Packaging - Gobble claims to have the most eco-friendly box in the entire meal-kit industry and it definitely seemed that way. Let's hope so because my dog ate the compostoble ice packs. Flavor - Pretty good! The meals we tried were good and satisfying and the portions were generous, but I wouldn't call them excellent or great. Price - I was given a credit from a fellow mom, so our initial order was around $35. Gobble meals are $11.95 each, so a bit more than the standard meal delivery service, I assume the higher prices is because the meals are mostly pre-prepped. Prep Time - Like Blue Apron and Green Chef - like you are making your own dinner; you will be chopping, slicing, dicing, zesting, etc. Each meal mostly comes in it's own separate box, which is helpful and the boxes fit nicely in a french door fridge. Packaging - Pretty much the same as the other services, except with the individual boxing mentioned above. They also have a handy recycling guide on their website. Flavor - Pretty good. That said, we personally found the Blue Apron food to be more fresh than Hello Fresh, so because of that Hello Fresh didn't taste quite as good as some of the competitors. Additonal deets - Pet peeve here but: the recipe cards are written in a paragraph format (as opposed to a list) and in my opinion that is pain to read when you are cooking (with a toddler, a hungry grade-schooler, a dog and whatever else is in your kitchen). I have heard more than one person say that fish they received from Hello Fresh smelled fishy. We did not have this issue, but it is concerning to me. *Disclaimer - if you use my HelloFresh code, I get $20, so thanks! 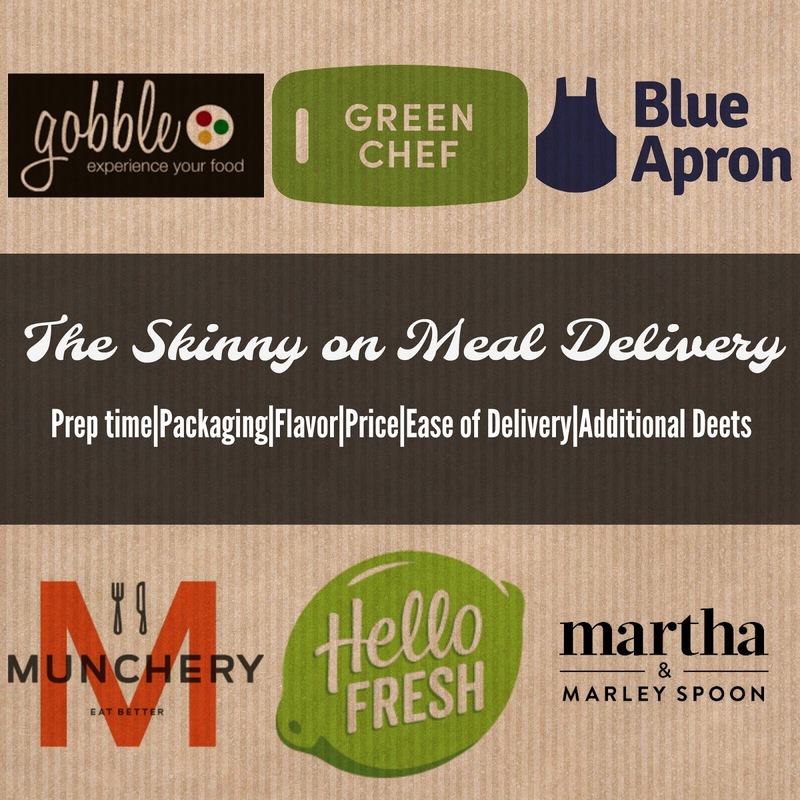 So friends, that is the skinny on meal delivery! Have you tried it? What are your favorites? Tell me more!